People who know Nicole Jakob might describe her as creative, an inventor, entrepreneur, devoted mother, and wife. We discovered that she’s also passionate about instilling good values in children—and downright funny. It seems that her need to create and her natural sense of humor might just be the glue that keeps this Winnetka mother of three grounded and determined to spread her message of giving and laughter. The naming of her business, Part-Time Renegade, LLC, is one case in point. And Renegade Made was born. Jakob founded her company, which creates and produces a line of Renegade Made craft and activity kits that teach children the value of altruism. From idea to inception was no easy task. “I came up with the idea a few years ago, and it took time to fine-tune and develop. Then I had to get it sourced, made, and tested. It was kind of crazy to launch a whole line at once! Most inventors start with one project.” Jakob launched with four fully developed activity kits. So, why now? Why crafts? Jakob also felt strongly that she needed to create something with amazing design and with kindness built in—and something that helps those parents who are not innately “crafty” and doesn’t require trips to the craft store. “My kits contain everything needed except a pair of scissors and a cup of water,” she says. This is where the creative inventor came in. “I wanted the kits to be irreverent and cheeky so that kids would be interested in them, and a little naughty too—because they have to disguise themselves and sneak around a bit,” she laughs. Jakob raised her own bar even higher by making a point not to dumb down anything. It had to be fun for kids but also give parents and adults a giggle. Oh, and, it was important to Jakob that the kits be equally beguiling for both boys and girls—another hurdle as many craft activities are targeted more toward girls. So, what did she come up with? Four craft kits designed for children eight and up. Each includes a project children can make at home, either alone or with their parents, siblings or friends, and provides ideas on how to share their art with strangers. 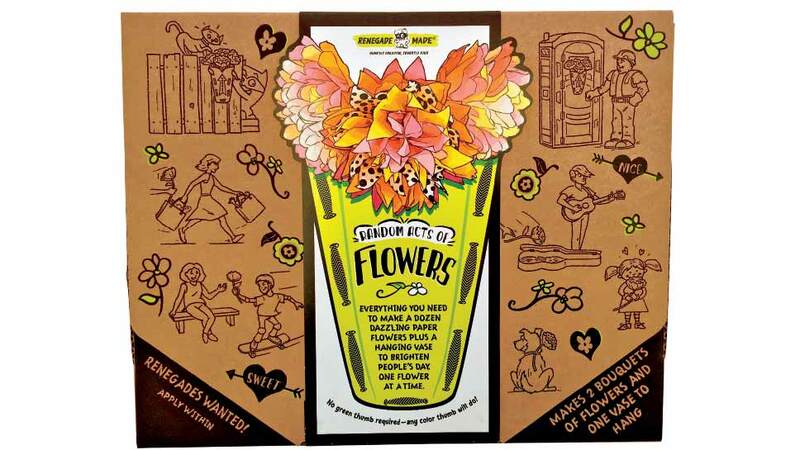 The Random Acts of Flowers kit, for example, includes materials to make 12 colorful flowers and a paper vase. The intention is for kids to then put on the renegade mask and hang the vase somewhere strangers will find it—such as a fence in a park. Ideally, the renegade can hang back (disguised) and watch as people take a flower and read the leaf-shaped tag and inspirational message attached. The three other kits: Sidewalk Tagging, the Fairly Painless Tattoo Lounge, and the Made You Look kit are equally creative, fun, and inspiring—even for “big kids.” One sorority purchased the Tattoo kit and used it as a fundraiser in lieu of a bake sale or car wash. 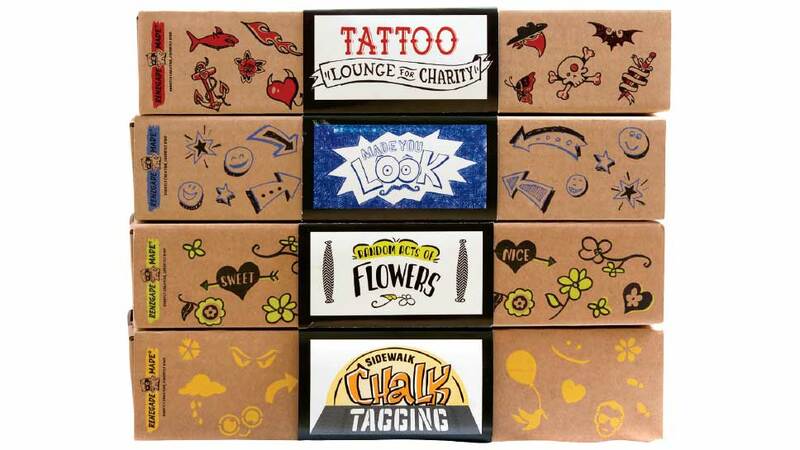 The Sidewalk Tagging kit allows kids to become “a graffiti artist” but using sidewalk chalk that washes off, to leave anonymous (and funny and kind) messages for people walking “over” the art that will make them smile or brighten their day. The final, and equally important, element for Jakob was to use proceeds from her kits to donate to charity. To that end, she selected Random Acts of Flowers and Camp Kesem as beneficiaries of Renegade Made profits. “I wanted to pick smaller charities that don’t get as much as the larger ones. I am a small company too (I’m the only employee!) and wanted to have a large impact,” Jakob says. It didn’t take long for Renegade Made to get picked up by numerous retailers around the North Shore, Chicago, nationally, and online—with the list growing daily. She’s also received numerous impressive awards, such as the Oppenheim Toy Portfolio Gold Seal Award 2016, two Parents’ Choice Silver Awards 2017, and the Creative Child Magazine Product of the Year 2017. So what’s next? Jakob hints at her new kit coming in the spring: something to do with pets… is all she’ll reveal for now. She also says she’d like to create larger kits in the future for people to use at birthday parties, scouting events, or even long term care facilities and hospitals. For more information, and to find out where to purchase Renegade Made kits, visit renegade-made.com.